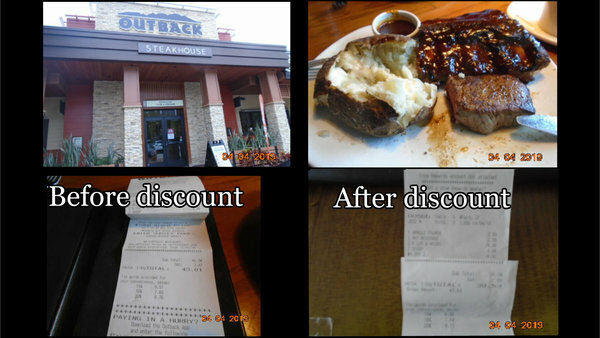 The last time I was at Outback I was pretty negative but taking blame for what we ordered and we have been back a couple of times and I thought it would only be fair to write a review giving the other side of the coin. Now I am not saying the Outback is gourmet dining and a must go to but in my opinion it is one of the few corporate chains that offer decent food at, sometimes, decent prices, excellent service, good parking, pleasant atmosphere. One thing most chains do is give you as many choices as they can and the Outback is no different with 4 menus to hunt down items! In the end Allen and I both had the 6-ounce sirloin steak & ribs ($14.99 each) with a side dish . We both had a baked potato with choice of sour cream and/or butter. A definite positive is that they don't charge extra for the side dish and/or warm bread--that Allen devoured but I did get to have a quarter of the 2 loaves LOL! He also had an Arnold Palmer ($2.99) and I had coffee ($2.99) and we both had a scoop of vanilla ice cream ($2.49 each) for dessert. A few minor quibbles--I find their steaks over seasoned and I usually ask them to go easy but I forgot this time but after scraping most of the seasoning off it was a very good steak. Also the ribs were drenched in sauce plus they served more sauce on the side! They were very tender, falling off the bone and I would definitely order them again with a request to go light on the sauce. The only quibble I had with the service is that the wet naps should have been served with the ribs not after but otherwise I couldn't have asked for or gotten better service. From entering and being greeted by the hostess and seated immediately after asking if we wanted a booth or table until we left with a thank you and goodbye from both the server and hostess it all in all was a pleasant lunch and more could you ask for? Sounds good! The last time I had a full rack at a steakhouse it was much too dry even tho it was only late afternoon. I forgot to take a picture of Allen as he got through eating them--looked like a baby with sauce all over his face, on his 'bib' (shirt), etc.